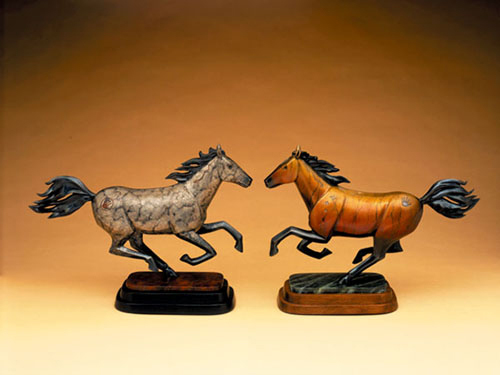 The idea of doing a bronze horse came after an invitation arrived to an art show in conjunction with the 2003 Kentucky Derby. While viewing other horse figures at my foundry’s gallery, what struck me was the fact that they all looked alike. They were anatomically correct and superbly portrayed. I knew I had to do something different, so I focused instead on the essence of the horse, its superior strength and vitality. I visited Kentucky prior to the show in order to view some of the thoroughbreds participating in the Derby. It was wintertime, so they weren’t very active. This gave me the opportunity to view them up close and touch them. Looking into their eyes, there was so much depth. It was then that the image I would portray came to me. After studying the muscle structure of horses, particularly when they are in full stride, I decided to emphasize the angular lines of their muscle patterns and give my horse an almost geometric touch. With the piece near completion, I visited a horse to make sure I had the correct final touches. This horse was far from a thoroughbred, but as I got close and studied him for some time, he began to frolic and kick, as if showing off for me. His actions showed me the unbroken spirit of a horse, regardless of how domesticated they may be. I carefully sculpted the eye sockets to express the vitality and depth I see when I look into a horse?s eyes. Along both sides of the neckline there are lightning bolts. The left is jagged, symbolizing the masculine energies of the universe, while the right bolt curves softly, representing the feminine. The left shoulder blade displays a sun, moon and star design, which emphasize the duality found in nature: the sun being male and the moon, female. The merging of the two results in a child, signified by the star. On the right shoulder blade are three circle designs. These circles are a common theme in my work, symbolizing the journey of the soul and its progression towards greater enlightenment or knowledge. On both thighs is a handprint. The circled handprint on the right thigh represents the divine guidance that humans and animals alike receive from the non-physical realm. The left handprint recognizes the relationship between man and horse. The horse has aided us in war, agriculture and travel. Today, as in the Kentucky Derby, horses are bred and trained for athletic competition. Nevertheless, there is a part of them that will always be wild and untamed. This spirit of freedom is what I see in their eyes and actions, and how the title of this piece came to be.